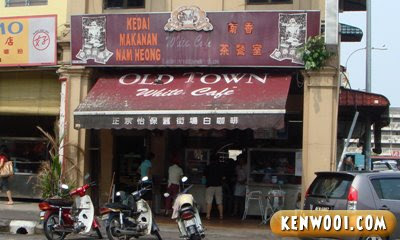 Nam Heong Old Town White Cafe is a famous kopitiam (aka coffee shop) located at Ipoh’s old town. People usually have quick lunch or tea break here. Getting a parking space is kinda hard and getting a table at Nam Heong is hard too. The most important factor you must possess while looking for food in Ipoh is patience. Nam Heong’s white coffee is famous in Ipoh – due to its unique flavour. The taste of the food is good and the portion is reasonable with the price. Order Char Kuey Teow and Chee Cheong Fun with mushroom gravy. There are more variety of food here but I didn’t take extra orders. On the same road itself, there’s another kopitiam called Kedai Kopi CT where you can have red bean soup for dessert. Kinda concentrated in my opinion, if you order without ice. Addition of ice should make it more diluted and obviously colder. It’s not hard to find this place in Ipoh town. There’s a landmark which can be easily spotted once you reach the town area. The landmark is a 20-storey flat – Kinta Height Flat. Both Nam Heong and CT coffee shops are located just around it. If you wanna know the exact location, click here to get the GPS coordinates for Nam Heong. Anyway, it’s worth a try when you’re in Ipoh! Stay tuned from more Ipoh Delicacy entries. Real Madrid Is Buying Kenaldo! To be honest, I also don't know how people can take such nice photos when they are eating! I have a DSLR too but I always fail to do that because I would concentrate on food instead! I might be going for a road trip with my friend soon so i might consider stopping by! thank you for recommending! haha i prefer the other one opposite this shop..
i used to snap snap snap photos on food before makan, during makan and after makan. and i don't do it anymore now. Ahhh now i know..next time i go ipoh who to ask to bring me around! First thing I thought was "white coffee"? Never heard of that. Hell, I don't feel fine even taking a camera to the kitchen here at home! Wait till you stay in KL for a long time then you will think of Ipoh food all the time! Gosh, I really missed the Chee Vheong Fun there. The KL ones make me sick. Chee Cheong Fun with mushroom sauce? So different from Singapore version. never been to these 2 shops b4 so duno. and u r wrong. ipoh food is still the best. coz whenever i see ipoh's stall at kl,it tasted differently n nt tat delicious. i havent even fnsh my a-level eh!!! In your opinion, which one taste better? Nam Heong or Old Town? oh you came from Ipoh? They said Ipoh very famous in Coffee correct or not? I don't know never tried it before. Hehe..
Food blog isn't your thing, give 'em up – ain't your thing again! Is that the original OldTown?! OMGGGGGGGGGG… look so tasty leh…. I think i prefer KL dim sum compare to Ipoh dim sum. I've started a new tech blog. I have a idea of forming a blogger group and exchanging links between us. But, it seems to be difficult. But, I have a new idea. I can't type all here. so, please have a look in my page. The post about "free backlinks for your site" is in my home page. then you always update that list..many will be added to my list in my blog and they will update the list also. for example look at this Rethnaraj V2's post..Yes it is my site also. but, i mean for example..
Yeah..i know this nam heong is just beside of this 20Flats. i miss yee pou nga choi kai!!! Ken, you got MSN? add me at blackflam85@hotmail.com. I got some questions to ask you. How much you spend on it? lets go when im back in malaysia. muahahha…welcome welcome to the food blogging!! i see that chee cheung fun looks a bit different frm penang one..is it tasty? Hey, I found your blog in bloggerunited and found this post is interesting. I am a food lover also.. Hehe… Those Ipoh foods look Nice man. By the way, I'm from Sabah, staying in KL now. Got nice "Chee Cheong Fun" there. The Nam Heong is my favourite kopitiam in Ipoh. The white coffee is like the best. Great food and great coffee..miss that place. Definitely beats the old town that's spawning everywhere like mushrooms in the klang valley. Quality not quantity. Definately have to give it a try when I am there. BTW, the coffee shop opps Nam Heong is equally good too, like their custards!